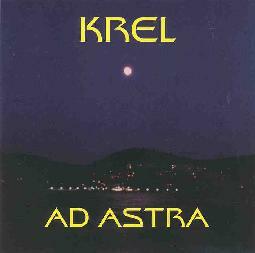 Formed in the late 1980's, Manchester England's Krel has released several cassettes over the years and played live with such bands as Hawkwind and Ozric Tentacles. Ad Astra is their first CD and it should be noted that label head Andy G. started Dead Earnest as a means to release the bands' latest recording. The lion's share of the music is played by Martin M., with original member Dave Nolan helping on guitar. The disc opens with "The Hour Of The Gate/Towers". Ambient keys, astronaut voices and shooting star synths provide a low-key intro that after about two minutes launches into a keyboard/synth heavy piece that is soon joined by wailing guitar. The vocals are pretty freaky, almost like a computer and they fit the music well. Krel really knows how to rock out. "Transmission/Nomad" starts very dreamily and the acoustic guitar gives it a kind of Pink Floyd sound. After about four minutes mission control announces the spacecraft's position in orbit and we are thrust into Hawkrock heaven. The melodies and spaced out lyrics completely carried me away. Definitely one of the best tracks. "Time/The End Of Time", and "I Can See Starz" are similar tunes that show Krel's adeptness with combining great melodies and spacey synths with a head bobbing rock beat. "Can anyone hear us? We are remaining on the air". This is the desperate transmission from space heard on "So Long", a short synth piece that serves as a lead in to the rocking "Star Fall". "Satellites" is probably the heaviest track on Ad Astra with a rawer sound and dirtier guitar. The synths never stop swirling and the listener is unnerved as all of a sudden the song goes into a quiet Pink Floyd cosmic moment before picking up the beat again. The aptly titled "To The Stars" is a great closing track with an intense psychedelic jam rock feel to it. Whooshing synths and slowly soloing guitar provide an easy descent to the finish. Hawkwind fans will drool over this disc, and fans of the dreamier side of space who aren't afraid to rock out will be pleased they took the plunge also. You can visit Krel at the Dead Earnest web site.